The group began with marine construction, building the first ship for the British Navy outside England. It traded in timber. It ventured into tea. It has taken up diverse ventures in its 250-year-old history. But it is in textiles, with Bombay Dyeing, established in 1879 by Nowrosjee Wadia, that the Wadia Group has left an indelible mark. "We are standing strong on a century-old foundation of trust, integrity and perseverance," says Jeh Wadia, Managing Director, Bombay Dyeing. What started as a small dyeing unit of India-spun cotton yarn, has turned into an empire across businesses, from textiles and furnishings to real estate. It now operates in three segments - textiles, polyester staple fibre and real estate. "The group and the companies have reinvented themselves," adds Wadia. He led the creation of the group's airline, GoAir. There have certainly been setbacks and bitter corporate battles, but Bombay Dyeing has ultimately risen above them to remain one of India's largest producers of textiles - daily production over 300,000 metre of fabric - with a distribution chain of more than 300 exclusive outlets across the country. The two most important corporate battles Bombay Dyeing has waged were those against Reliance Industries in the 1980s and jute baron Arun Bajoria in the past decade. As described vividly in the book Polyester Prince by Hamish McDonald, once the Dhirubhai Ambani-led Reliance also ventured into manufacturing polyester clothing, Bombay Dyeing found it hard to sustain business, because duties made the chemical dimethyl terephthalate, or dmt, which it used as a key ingredient, more expensive to import than purified terephthalic acid, which Reliance used. It was alleged that this was a result of Ambani's excessive influence on the central government then. The second big crisis arose when Bajoria bought up almost 15 per cent of Bombay Dyeing's shares and threatened to make an open offer - which could have resulted in him taking over the company - unless the shares were bought back from him by Bombay Dyeing at a premium. But after much wrangling, Bajoria finally chose not to pursue the fight. "The first 100 years have ended and the second century begins," John B. Koffend quotes Jeh's father Nusli Wadia as saying in his book Bombay Dyeing: The First Hundred Years. "I am struck by the impressive distance traversed by the company since its origin in a red-brick yarn dyeing shed." 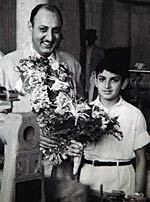 As Nusli Wadia, Muhammad Ali Jinnah's grandson, prepares to hand over the baton to his sons, Jeh and Ness, the business he inherited is very different from what his father left him. 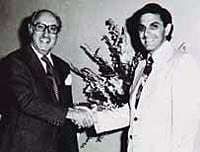 1971: Neville N. Wadia, Nusli Wadia's father, wants to sell the company to Calcuttabased R.P. Goenka and retire. Nusli opposes sale, enlists J.R.D Tata's support in the shareholders' battle that follows, prevents sale.